This recipe was given to me by my good friend Leonie’s mum, Jo. It’s simple but so yummy! In fact, I think my dad is in love with this more than anything I have ever baked (although he has never disliked anything I’ve made). 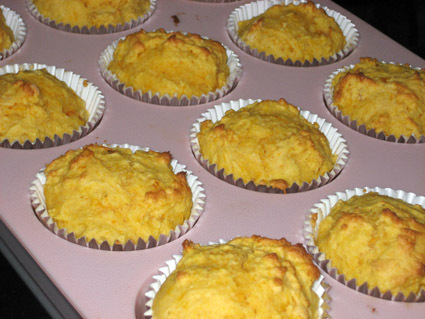 The mixture can be cooked in a loaf tin, on a baking tray or in a muffin tray (my favourite) for pumpkin cupcakes. The recipe requires butternut pumpkin, which is known as butternut squash in other parts of the world. I don’t think it needs anything on top, but I may experiment with a topping another time. Leonie tells me it’s great with butter! The consistency of the damper is cake-like, and the taste is not too sweet and not too savoury — Perfect for afternoon tea. It’s also gluten-free friendly when you use gluten-free, self-raising flour. Thank you Jo for the recipe! Preheat oven to 180 degrees Celsius/355 degrees Fahrenheit. Mix sugar and butter with a fork until creamy. Add mashed pumpkin, stir through. Add beaten eggs. Pour into a loaf tin or cupcake tray. Bake 30 minutes in a loaf tin or baking tray or 15 minutes in cupcake/muffin tray. Thanks for the pumpkin cupcakes! I’m making them with the Japanese pumpkin for Halloween on the Gold Coast. Hi Heather, I’m glad it worked out well for you. I think it’s time I made another batch!